As the club announced, Emporio Armani Milano agreed in terms with Davide, Dada, Pascolo, 2.03, born in Udine, on December, 14, 1990. Pascolo is a member of the Italian national team preparing for the Olympic Qualifying Turnament in Torino next month. 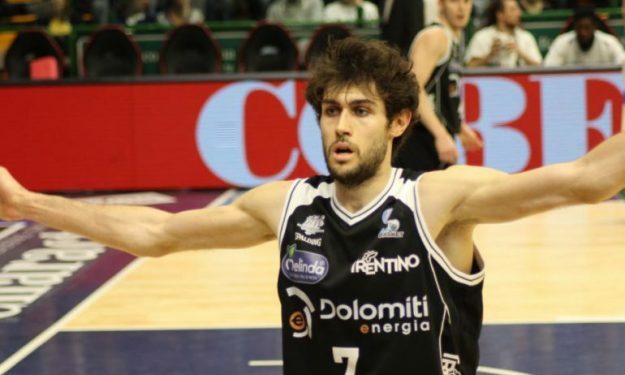 A power forward from Friuli region, Pascolo made his debut in the Italian Serie A during the 2008/09 season in Udine (only two games played) before returning to the big stage with Trento in 2014/15. In that season he averaged 12.0 ppg, shooting 58.2% from two and 79.5% from the line while adding 7.6 rebounds per game in 27.8 minutes. During the last season, he averaged 12.2 points per game in 26.4 minutes while converting 57.5% of his two-point shots and 80.0% of his free throws attempts. He also averaged 5.8 rebounds per game. During the last seasn he also made his Eurocup debut with 22 games played, 284 minutes per gam, 15.0 points per game and 6.1 rebounds. He also converted 62.3% of his two-point shts, 43.3% of his three-pointers and 79.6% of his free throws. He was included in the All-Eurocup first team. Previously he won two minor league championships in Trento. He grew up in Fagagna (where he was coached by his mom, Anna, a former voleyball player and minibasket instructor), then he moved to Udine and stayed there until 2011 when he went to Trento. There, he won a Legadue’s Italy Cup in 2013. He also played the Under 20 European Championship, made his debut with the National team in 2013 and was Trentino’s Cup MVP in 2015 with the Italian team. His father, Andrea, was a minor leagues player in Italy. His brother Marco, three years his junior, is playing ball a South Dakota in Division II.